In this video, Chris Rollins shares his tips for safely flying your drone from a moving boat. How about lift-off and landing on a boat? Also, set for Return to RC, instead of Hover. How about lift-off and landing on a boat? Hand releasing and catching is usually easiest/safest when on a boat. Also, set for Return to RC, instead of Hover. DJI drones are not able to return to the RC. They can only return to the last marked home point. If the boat is not moving, you could certainly reset the home point to the new location after moving. If the boat is constantly moving, constantly resetting the home point would not be very practical. 2.) Where the Pilot is with the RC. A DJI GO 4 manual taking an in-depth look at the features and settings in DJI Go 4 app. I’ve never tried it from a boat, but it seems like it should work. True. However, that only sets the home point to a new location. The home point is not automatically reset each time the pilot moves to a new location. I’m guessing you can see the problem here. The pilot sets the home point, moves the boat, and the drone lands at the last set home point (in the water). Not as I understand it from the DJI Support person I just talked to, once it’s set for RTH point of the RC it senses where the RC is and flies to wherever the RC is at that time it’s returning. Does it not then use the same technology as the Intelligent Flight Mode of “Follow Me” work? Whereas, the aircraft tracks your location using the GPS accuracy of the Mobile Device. Does it not then use the same technology as the Intelligent Flight Mode of “Follow Me” work? Resetting the home point does just that. It permanently sets the home point to a new location for the entire flight until it’s manually reset again. If you’re flying a drone that has the “Enable Dynamic Home Point” feature (see the screenshot below), you can enable it to auto reset the home point to the mobile device’s current location throughout the flight. 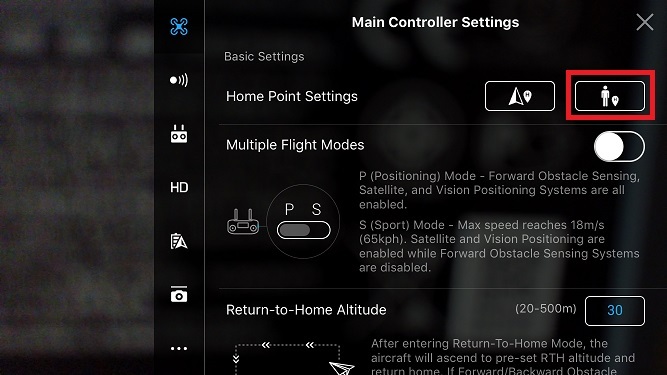 However, that feature only works when flying in ActiveTrack mode. And if you decide to use this dynamic home point feature, you should make sure you’re using a mobile device that has a GPS receiver. If you’re using a mobile phone or other device that does not have a GPS receiver, you can connect an external GPS receiver (like the Garmin GLO) to the mobile device to ensure the home point is being dynamically set to an accurate location. Thanx! I thought you’d be able to clear the air on this. So, best practice, fly back to you on first low battery warning of 30% to avoid taking a swim. Yes, flying back to the home point before the battery is too low is another important point (not mentioned in the video above). Even with that in mind, you still need to have a plan if the remote controller signal is disconnected. 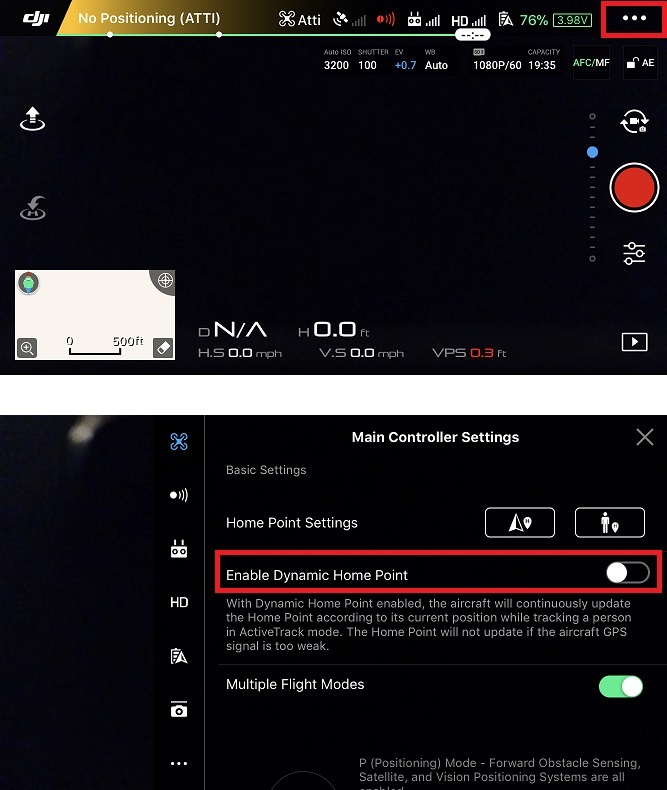 DJI drones CAN be set via Go app to follow the controller. NOTE: this rarely works (many threads on this) since it requires <30 meters (10feet) of accuracy which is hard to get. In the numerous threads it talks about DJI needing to make this more relaxed. There are also MIXED opinions on turning off the downward sensors. Any thoughts on that? Can you share some more details on this one? 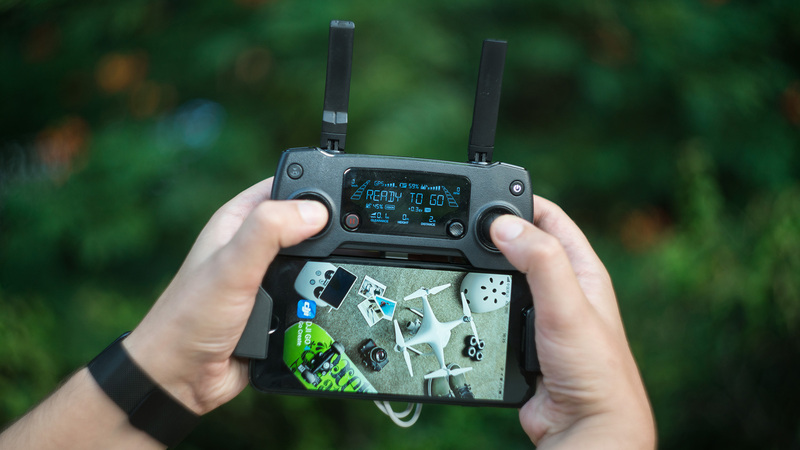 Where do you see that setting in DJI GO? 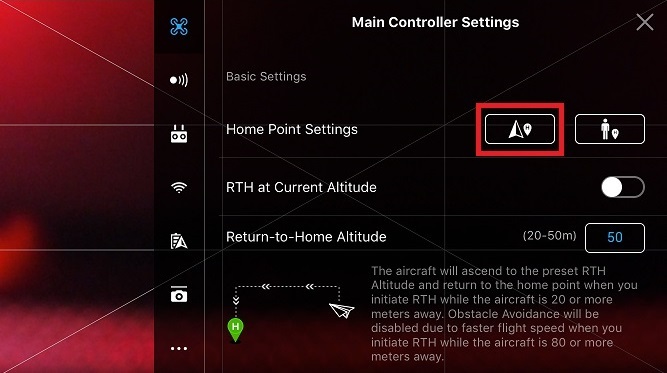 Sure… in the drone settings, look for “Home Point Settings” Within that there are two icons - one with a triangle and H, the other with a person and H. The icon with triangle (drone) sets the location to where the drone is. So if you are on a lake and launch then drive around the lake - hitting that will tell the home point to now be where the drone is currently located. Using the person icon will do the same but set the new home location based on where the controller is. NOTE: your phone or tablet MUST have GPS capability (wifi iPads do not). Also you have to have less than 10 feet accurate for it to work. 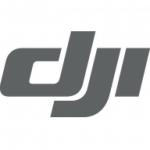 Most on the forums have not gotten this to work and are pressing DJI to make it less sensitive. For me on the lake, I just had to use the “drone (triangle)” icon every so often. The day I used this i was mile+ away from launch point. So this was very helpful. Also setting RTH to hover is also helpful. I had a screen shot to attach but don’t see a way to attach. Google DJI Return to home settings if you want screen shots or videos. The icon with triangle (drone) sets the location to where the drone is. So if you are on a lake and launch then drive around the lake - hitting that will tell the home point to now be where the drone is currently located. Using the person icon will do the same but set the new home location based on where the controller is. Right. But, I thought you said there is a setting to make the home point follow the remote controller? Other than the ActiveTrack setting I mentioned above, I’ve never seen such a setting in DJI GO. Evidently, it doesn’t constantly update the RC location. Only records Home Point Location when you actually hit the icon at that particular location. You’re making sense. The problem is your information is not correct. The home point does not automatically move after the aircraft or mobile device moves. The pilot must tap either button again to reset the home point.